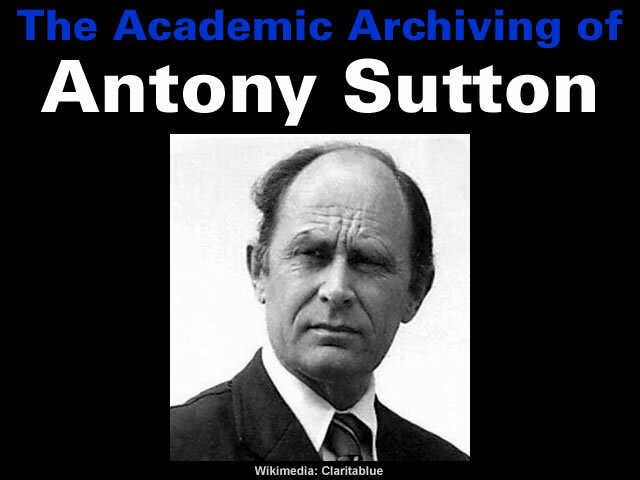 Antony Sutton was a perceptive academic who was “persecuted but never prosecuted”. Sutton studied at the universities of London, Göttingen, and California and received his D.Sc. from the University of Southampton. He was an economics professor at California State University, Los Angeles and a research fellow at Stanford University’s Hoover Institution from 1968 to 1973. His problems began in 1973 when he “popularized” the idea that the United States and it’s NATO allies had built the best enemy money can buy i.e. the Soviet Union. In 1973, Sutton published a popularized, condensed version of the sections of the forthcoming third volume relevant to military technology called National Suicide: Military Aid to the Soviet Union after which he was forced out of the Hoover Institution. The update to the text, The Best Enemy Money Can Buy, looked at the role of military technology transfers up to the 1980s. there is no such thing as Soviet technology. Almost all – perhaps 90–95 percent – came directly or indirectly from the United States and its allies. In effect the United States and the NATO countries have built the Soviet Union. Its industrial and its military capabilities. This massive construction job has taken 50 years. Since the Revolution in 1917. It has been carried out through trade and the sale of plants, equipment and technical assistance. Back in 1973 this author published National Suicide: Military Aid to the Soviet Union, itself a sequel to a three volume academic study, Western Technology and Soviet Economic Development, published by the Hoover Institution, Stanford University. These four books are detailed verifiable catalogs of Western technology used and in use by the Soviet Union, acquired by gift, purchase, illegal diversion or theft. Taken together, these four volumes constitute an extraordinary commentary on a basic weakness in the Soviet system and an equally extraordinary weakness in Western policy making. He then proceeded to detail the role of Wall Street in significant historical events. Sutton’s next three major published books (Wall Street and the Bolshevik Revolution, Wall Street and FDR and Wall Street and the Rise of Hitler) detailed Wall Street’s involvement in the Bolshevik Revolution to destroy Russia as an economic competitor and turn it into “a captive market and a technical colony to be exploited by a few high-powered American financiers and the corporations under their control” as well as its decisive contributions to the rise of Adolf Hitler and Franklin Delano Roosevelt, whose policies he assessed as being essentially the same “corporate socialism,” planned by the big corporations. The works of Antony Sutton are essential reading. The works of Antony Sutton should be dismissed and/or derided. In political economy and political science the effect of Hegel’s collectivistic conception of the State supplanted to a large extent the individualistic conception which was handed down from the eighteenth century to the nineteenth century. Independent observers are free to review the evidence and draw their own conclusions. The religious become apoplectic and resort to ad hominem and violence when facts change, while the irreligious simply change their minds. It also depends on where one is psychologically – either in The Matrix or outside it. Given that the Western World has its genesis in the Little Ice Age, and the Abrahamic faiths before that event in the 1st millennium after some global catastrophe, it does seem that the traumatised survivors, our civilisation, have tried to flee from the memories of that catastrophe by retreating into the surreality of The Matrix and religion. As Velikovsky noted in his posthumous book, Mankind in Amnesia, those survivors of past catastrophes, like those who survived the atomic blasts of WWII in Japan, ended up believing that they were chosen, and hence special. This belief of being chosen is a non-sequitur however, and forms the religious foundations of the many human cultures. It’s the inability to forget that seems the problem, and this inability manifests as fossilised memories and hence human thought. Challenging those beliefs inevitably leads to cognitive dissonance and ultimately physical violence. The problem is that as human physical violence is always premeditated, then its origins in the inherent violence of our religious beliefs need understanding. It’s the violence of our thinking that’s the problem, not the subsequent physical violence. So it matters very much that we need to understand how humans think, since it’s our premeditations that seem to be the cause of human conflict. The problem is monotheism and its intrinsic totalitarianism. Rus has actually developed some tech of its won, but the west spy system is well funded and all humans have a price…. so they knew how weak Russia was and is, still. To some extent, this is a conspiracy of elites. But we will need that tech to planet hop and the sooner, the better! Great way of keeping workers in line, but clearly undesirable in the long term. It is shameful to see it being used again, but perhaps after the final war, with man made tsunami devastating the USA, we will stop the bloody slaughter? Man is mostly animal. Catastrophe is almost certainly moderated by EMF from the Filaments, and humans are good receptors, so hysteria will continue to increase.